While many people may think of the food service industry as being mostly about restaurants and even food trucks, there are plenty of businesses in the field that don’t fit into those boxes. For example, catering services can prepare their menus in just about any setting, while food cart owners can take their offerings on the go as well. But while having that kind of added flexibility can be very good when it comes to connecting with individuals or clients, it also poses unique liability issues that these businesses will need to address. When it comes to catering, for example, there are many companies that bring their own cooking equipment to clients’ functions, whether that’s at an office, a home, or another venue, according to a report from Rental Management. That may be particularly true in the summertime, when many catered events are held outdoors, and based around barbecue food or the like. With this in mind, there are certain precautions that simply need to be taken to avoid things like burns and fires. 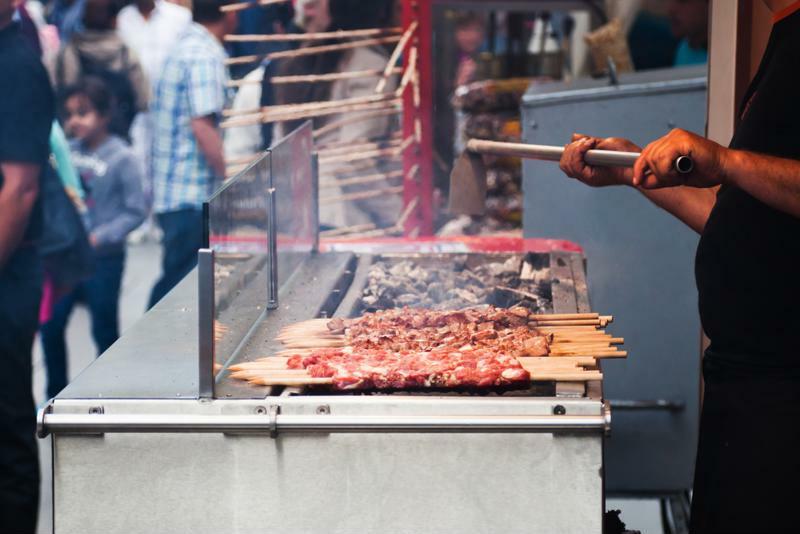 Food carts can be quite popular, but owners must know the risks. Another potential problem of which caterers must generally be aware is food safety, because if they’re serving potentially hundreds of people over the course of a weekend, even one issue can put a lot of people in the hospital. Just such an incident happened late last year in Brantford, Ontario, according to a report from the Brantford Expositor. This can sometimes happen to caterers because they have less control over the environments in which they serve their offerings. In this case, a caterer was charged last December for “providing food unfit for human consumption,” and “operating a food premise without notifying the health unit,” the report said. The company served at a luncheon with at least 150 people in attendance, where egg salad, chicken wraps, and potato salad were available to guests. A number of people reported they were made ill by the food. It was further found that the caterer was not registered, and its facilities – such as they were – had not been inspected by local officials. Meanwhile, in much the same way food trucks have become quite en vogue in recent years, food carts are likewise experiencing an upturn in popularity, according to the Oregonian. However, their owners face certain risk that other food service businesses may not. For instance, the carts themselves need to be stored somewhere, and that can open them up to problems such as one experienced last year in Portland, Oregon. There, five carts were put out of business by an early morning fire. While the cause of the blaze wasn’t immediately apparent, the fact that they were stored in close proximity with propane tanks connected was immediately cited as a hazard. With all this in mind, owners of these kinds of food companies may want to think about how the unique risks they face affect their insurance liability. Often, the policies they have may not meet as many of their needs as they may think, and finding additional coverage to fill in those gaps can be quite valuable going forward.